Welcome to Starkweather and Sons Roofing and Siding, a Christian family-owned and operated home improvement business based out of Wauseon, Ohio. At Starkweather and Sons we base our professionalism on the same values that started our roofing and siding business with in 1976. The result of over 40 Years of Home Improvement Service is consistent, quality, dependable roofing, siding and window installations and products. As one of Northwest Ohio's leaders in the roofing, siding and window industry, Starkweather's commitment to customer satisfaction and excellence are part of every home improvement project, whether a roof repair or roof replacement, siding, or replacement window project. At Starkweather and Sons we utilize innovative, quality-driven products to provide the best roofing, siding, and window solutions for your home. Our key to success begins with our crews. They are manufacturer certified to properly install all building materials we utilize. As a homeowner, you are guaranteed a professional job that will last today, and tomorrow. A Starkweather family member oversees all of our crews; we never subcontract our work out. Join our many satisfied home owners by simply submitting an estimate request or giving us a call. 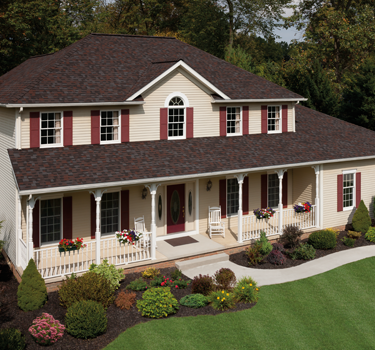 Starkweather and Sons Roofing and Siding is committed to provide courteous and professional customer service when it comes to home improvements like roofing, windows and siding. Our years of experience and expertise in replacing roofs, siding and windows are yours for the asking! your free in home consultation for a new roof, replacement windows or new residential siding at 419-337-2116 or click to request an estimate now.